After a short time at home following a successful racing trip to Cottbus, it wasn’t long before I was off again! This time, to Poland, for the Poland GP with Scottish Cycling. I didn’t get much rest once I’d got back, a whole two days at home. Just enough time to say hello and then goodbye to my family. I had never been to Poland so it was also a chance for me to go to somewhere new, something that would excite anyone. This meant I had never ridden the track either so it would be a new experience for me. What most excited me was another chance to get more high quality racing under my belt in the build-up to the summer season, especially with the potential of being selected for the UEC European Championships. I am still waiting to hear whether I’ve been selected to race for Great Britain. Getting as much racing as I can before the height of the season is so important as to how well you can race, this is a lot more important than how fast you are. You could have all the power and speed in the world but, if you don’t know how to use it effectively then it’s not much use. So, racing opportunities are essential in development as it presents a chance to learn and improve from all the mistakes you’ve made. 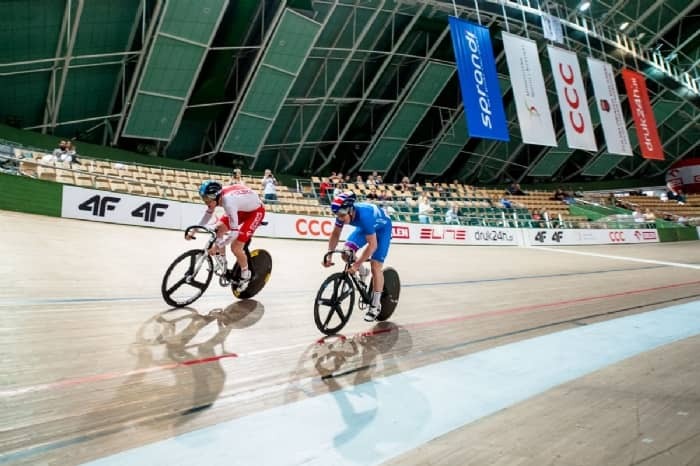 We flew out on the Thursday and racing began on the Friday with the elite Team Sprint, Saturday would be the Junior Keirin (but more on that later) and Sunday the Junior Sprint. Team Sprint is my favourite sprint event so I was really looking forward to this. I would race it with Alistair Fielding and Jamie Alexander racing for Scotland, which for some reason the commentator couldn’t quite understand as he would continually refer to us as Great Britain. After all, Mel Gibson didn’t fight for our freedom for nothing! ;) We had never done a team sprint together so, this would be a first. After a primer session in the morning, which consisted of some roller rev outs and starts, this was aimed to get the hours of travelling out our legs before we raced. Before we knew it, we were lined up on the start line, the countdown began and we waited nervously for 0. The countdown finished and the gate released but, unfortunately Ali had tried to go before that so he got caught in the gate, his wheel slipped and it went all downhill from there. This meant we had a slower opening lap and therefore a slower delivery speed into the second lap and after Jamie had done his lap it was up to me to finish it off and I did, but, very slowly. The travelling was still firmly in my legs and I wasn’t fully warmed up leading to a less than desirable lap time and team sprint time. Against all odds, we qualified 4th out of 4 teams… This meant we had a bronze medal ride off against Ukraine. In the bronze medal final, eager Ali still hadn’t seemed to grasp the idea of going when the timer was at 0 as he went early again, but in fairness to him in both rounds the timer was slightly out resulting in the two early starts. This resulted in another slow time but I had a much better lap so it wasn’t all bad. If it wasn’t for the dodgy start gate it could have been a different story but it was a successful day nevertheless. The Junior Keirin was meant to be on Saturday however, they decided to cancel it and this being my 2nd favourite event, this wasn’t welcome news. Instead, I did some starts and flying 100s on track in between the morning and afternoon sessions. This was to prepare me for my flying 200m qualifying the next day. It was Sunday and the day of the sprint. First, was qualifying and after being sick for an unknown reason I wasn’t feeling so up for it. My time was 10.82 qualifying me 8th. I wasn’t overjoyed with it, but it was a starting point for the day. In the first-round I raced someone who had qualified 10.6 but I raced well, won and progressed through to the quarter finals. In the quarter finals, I raced someone who qualified 10.5 and after controlling the race from the front and measuring my effort well, I managed to beat him despite the large difference in speed. Now I was through to the semi-finals in the afternoon session. If you have read my last blog, you’ll know between sessions I enjoy a cold shower and to listen to Rocket Man and yep, you guessed it, that’s exactly what I did. In the semi-final, I was against someone who qualified 10.9 and had also knocked out faster opponents. After some very close and 3 entertaining heats, I didn’t make it through to the gold medal ride off and had to settle for the bronze medal ride off. My opponent had qualified 10.5 so, was a lot faster than me, but there was still a chance I could win. In the first ride against him I misjudged his speed coming into the last lap and he managed to come around me and I wasn’t strong enough to come back and he took the win. In the second ride, I tried a very alternative tactic of going from the start to try and catch him out. A massive push from my team mate Alistair Fielding set me off to a good start and I managed to get an advantage of 40m I held it well for the first two laps but, died a horrible death on the last lap as did my opponent, but I wasn’t fast enough as he passed me in the last half lap to take the win. I finished 4th after qualifying 8th so I was still more than pleased with that. It was a great weekend, mistakes were made, lessons were learned and I had a lot of fun. 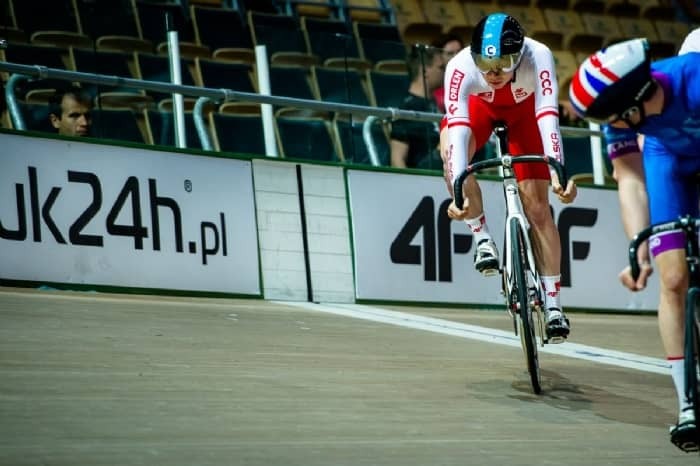 A huge thank you to Scottish Cycling for the incredible racing opportunity in Poland it is much appreciated. If you’d like to keep up with my racing and find out what I’m up to before my blogs are posted, then make sure to follow me on twitter @Lewis_R_Stewart. I’d like to thank Braveheart Cycling Fund, UK Sport, British Cycling, Scottish Cycling and Glasgow Cycle Team for their continued support.